Time is surely passing by rather quickly. Amira is full swing in her fourth grade year of school this year. In the fourth grade year, they are not babies anymore. Her school changes classes for each subject. They are now mastering note taking, studying, and critical thinking. While I am fairly satisfied with the school system here in Memphis, the school doesn’t offer certain components of the curriculum that I’d like to see. For example, foreign language and coding aren’t offered at her school. Her dad and I have invested in both coding and foreign language outside of the classroom. 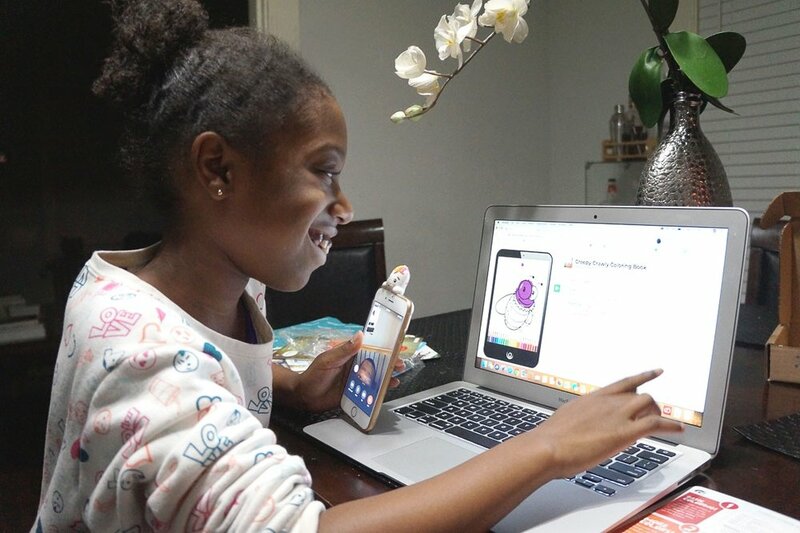 This past summer, her dad invested in iD Tech Coding camp at the University of Memphis and she absolutely loved it. So much so that he browsed for other programs to nurture her love of coding. A few weeks later, we received a Bitsbox Kids subscription box in the mail. You all probably know that we love kids subscription boxes in this family. Each month, we receive an email letting us know her Bitsbox is on the way. We get so excited! Yes WE!!! Every box comes with a mix of coding projects, ranging from simple to more advanced. We do have to take the time to read through the cards because they don’t come with a set of instructions. Only downer—but hey we can read so we get through it. Her recent box had the cutest little creepy crawler coloring book project. She had to code a set of colored pencils to different shades and make the screen touch screen to tap the colors. I'll be very honest, I love working with the project just as much as she does. I wish I would have learned coding over the years to apply it to my web design business. It’s never too late and always pretty cool to learn with your child. Each time she receives a box, I try to teach her to follow the coding sheet and its instructions step by step, use the video instructions given, and create the code. It's important for me to teach her to be patient and pay attention to detail while working with code. Coding is like learning another language. It can be intimidating but when you are patient, it is rewarding. I’d suggest working with your child the first couple of times. Third time should be a charm and they can work independently. The BItsbox subscriptions start at $16.95 per month delivered right to your doorsteps. It’s pretty easy. You don’t need much in materials except for a computer. A Mac or PC works perfectly fine. What we love as well are the stickers she collects as she finishes each coding project. I have seen her grow so much more confident as she plasters the stickers all over her MacBook. HAVE YOU ALL TRIED BITSBOX? DO YOU LIKE IT? GO AHEAD & SIGN UP!